On this seven-day charter, we highlight the beauty and allure of St John as we experience its fantastic anchorages and attractions along with a few of the hotspots in the British Virgin Islands which make this region of the Caribbean a sailor’s paradise. With two thirds of St. John made up of national park, this popular destination is recognized as one of the most beautiful islands in the Virgin Islands. Less is more on St. John. It's the smallest, quietest, least populated and most secluded of the three U.S. Virgin Islands, where even the residents of neighboring St. Thomas and St. Croix come to get away from it all. That's not to say there isn't a plethora of tourist-friendly beaches (all 44 are open to the public) and frosty blender drinks. Shore excursions run the gamut from snorkeling to eco-hikes. And there's shopping, of course, though truth be told local handicrafts who hold their own against mass-produced duty-free goods -- St. John's tranquility has transformed it into artists' community of sorts, and several have stores in town. St. John will be our midway point throughout the charter with excursions over to St Thomas as well as Jost Van Dyke and other favorites of the British Virgin Islands. "You guys are fantastic! The food was wonderful and we appreciate your sense of humor! The trip had so many high points; the snorkeling, fishing, suntanning, sailing, beautiful beaches, and great company. The competitions were fun….of course the girls' team won! Thanks for everything." This island is extremely convenient to local shops and restaurants in St. Thomas. We suggest you bring a camera because the views are breathtaking! A rocky bay, perfect for strolling along the beach as you search for that perfect oceanic souvenir to take home and show off to others. A great place to utilize your on-board snorkeling equipment. This secluded island offers beaches full of marine life and reefs close to shore where you can relax on the white sandy beaches. A small, yet charming island which is perfect for mooring the catamaran as you enjoy the calm waters, swimming and snorkeling. Jost Van Dyke has fewer than 200 inhabitants and they are widely known as a welcoming people. The island's name conjures up its rich, colorful past. Jost Van Dyke is said to have been named for an early Dutch settler, a former pirate. Although it measures just four miles by three, with the highest point at 1,054 feet, this rugged island has been home to many people, including the Arawak Indians, Caribs, Dutch, Africans and British. At Great Harbour, Little Harbour and White Bay there are safe, protected anchorages and unspoiled beaches shaded with coconut palms and sea grape trees. Discover inviting restaurants, bars, and small shops selling local treasures. For lunch, there are barbecues, West Indian rotis, flying fish sandwiches, grilled fresh fish and lobster. Club Paradise is famous for its conch stew and barbecued ribs. Happy Laury's Snack Bar is known for its pig roasts and honey-dipped chicken. The Soggy Dollar Bar and Gertrude's in White Bay are renowned for drinks made with the island's famous rum, frosty beers and tales of pirates and sunken treasure. Parties here are legendary, especially at Foxy's. This bar and its owner are known to travelers from around the world for the New Year's Eve and Halloween parties, when Great Harbour fills up with yachts. The "Painkiller," one of the most famous cocktails in the Caribbean, was invented at The Soggy Dollar Bar. 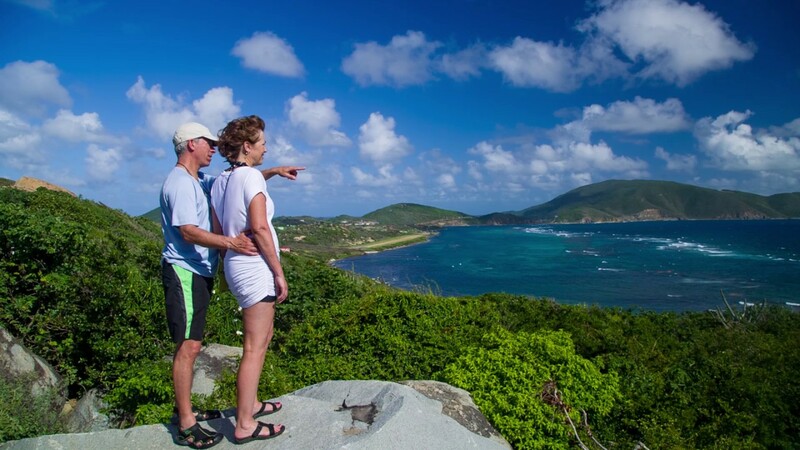 Explore Jost Van Dyke's history in the vegetation-covered ruins of centuries-old sugar mills, or on the old trails that crisscross the island. William Thornton, architect of the U.S. Capitol Building, was born on Jost Van Dyke, and John Lettsome, founder of the London Medical Society, was born on neighboring Little Jost. In the autumn and winter, observe whales and dolphins from a peaceful hilltop, or visit the East End of the island where you can relax in the natural Jacuzzi formed by the foaming seas. Little Jost and Sandy Cay are a short boat ride away, and on nearby Great Tobago you'll find extraordinary advanced dive sites and a marine sanctuary that shelters a nesting colony of magnificent frigate birds. Jost Van Dyke is accessible by boat or ferry. Accommodations are available at several small hotels and simple beachside cottages or stay at a campground at White Bay or Tula's. Whether you’re staying on land or lying at anchor, you're sure to go home with many memories of this unforgettable island. Your flight itinerary for arriving in the British Virgin Islands can consist of flights either into St. Thomas or Beef Island, Tortola. If you land in St. Thomas (STT), you will need to take a 50-minute Ferry ride from Charlotte Amalie in St. Thomas to Road Town in Tortola. The ferry is approximately a 10-minute taxi ride from the airport with the last ferry leaving to Road Town around 4pm. Once you arrive in Road Town, Sebastian's Taxi Service will be waiting to take you on a 15-minute ride from the Ferry dock to our base. Some guests choose to fly directly into Tortola's Beef Island Airport (EIS) which will be via San Juan, Puerto Rico. From The Beef Island Airport, taxi service is available to take you to our Hodges Creek base location. Sometimes making travel arrangements to other countries can be difficult because it is hard to remember what time zone you are visiting. For your convenience, we have provided the current time in the BVI. After arriving in Charlotte Amalie, St. Thomas you will take the St. Thomas/Tortola Ferry to Road Town, Tortola. Roundtrip ticket is approximately $60/adult. Click here for a complete ferry schedule. Hodges Creek Marina is located on the east end of Tortola, minutes from Beef Island airport and 15-minute shuttle ride from the Road Town ferry dock. The meeting time to board the yacht is at 5 pm on Saturday or 5 pm on Sunday depending on your scheduled departure day. You will have dinner aboard the yacht at the base that evening and the yacht will depart the following morning. To ensure your catamaran is cleaned and provisioned accordingly for your charter, we allow you to board the vessel no earlier than 5 pm on your arrival day. For guests choosing to come in early or stay later for a few days we can recommend options but we also encourage you to visit www.BVIWelcome.com for a full list of options. Marias by the Sea Close to Road Town. Windward Passage Hotel located walking distance to the Charlotte Amalie ferry dock in St Thomas. When making your reservation, please use promo code: Fsailing for access to exclusive rates. US Citizens must have a valid passport. Citizens of other countries should confirm entry requirements with their consulate. Also, Tortola charges a departure tax of $20 per person by air, and $20 per person by sea. Additionally, upon entry, all guests will have to pay a $10 environmental fee per person. Cash is required. Inquire today for discounted pricing or join our newsletter to get our best deals straight to your inbox! *Based on double occupancy. Offer is not valid on previously made reservations, or in conjunction with other discounts, promotions, packages, member usage or referral pricing. Valid for any available sailing date in St. John in 2019. A cruising permit fee may apply at the time of reservation. A 50% deposit is required under this promotional offer. Call for details. Where do you board the boat in St. John? Although St. John is a part of the USVI, you will board the boat at 5pm on Tortola, BVI. We are located at Hodges Creek Marina. Does the St. John itinerary require a passport? Yes, because this itinerary offers popular stops in the British Virgin Islands and boarding the yacht takes place in Tortola, a passport is required. There is a cruising permit fee of $59.00 that will be added to your charter price at the time of reservation. Why do cruising permit fees cost more than the BVI itinerary? Because our St. John itinerary offers popular island stops in the BVI as well as the USVI. There are two separate cruising permit fees. We have added them together for your convenience. Which Lagoon yacht can I charter? We offer the Lagoon 450 for the St. John itinerary. This yacht holds 8 passengers but this itinerary sets sail with a maximum of 6 passengers. Occupancy aboard some our catamarans is limited to 8 guests in Caribbean. When chartering with children under the age of 16, you must reserve all guest cabins on the yacht. When party exceeds eight in total, two or more yachts will sail in tandem. Special flotilla discounts may be available for reservations of more than one yacht. A 50% deposit is required for Caribbean bookings. Balance of charter amount is due 60 days prior to departure. A 100% deposit is required for reservations made inside 90 days. Two dinners ashore on Caribbean charters. Local cruising permits and park fees (if any), gratuities for crew, special requested liquors. We welcome you aboard at our home base at Hodges Creek in Tortola, BVI. After a cocktail, we enjoy our first dinner aboard. We depart for Norman Island for a beautiful dinner in The Bight. We enjoy a relaxing evening under the stars. We awake to the smell of fresh coffee and breakfast as we get ready for a morning of snorkeling The Indians. These incredible rock formations, reach up from 50 feet off the ocean floor forming beautiful rock pinnacles that reach toward the sky. Colorful corals make for a natural aquarium where you can snorkel through the rock saddle into an incredible shallow blue pool. Don’t forget the camera to capture incredible underwater shots. After lunch back at the boat, we sail to the south side of St. John’s Cruz Bay. After a quick check in at customs, we spend the afternoon exploring the fantastic shops this main hub of St John. Back on to the boat and then we’re off to Caneel Bay where we’ll spend the evening enjoying the beautiful beaches and you can experience the amazing 170-acre resort created by Laurence Rockefeller. Today we head toward St Thomas the island of Great St. James. Located just off the southeast tip of St. Thomas, this small island offers some incredible snorkeling in its sheltered Christmas Cove. With a small inlet in the middle of the cove, there is easy snorkel right from the yacht. The Stragglers, a rocky outcropping leading south from the island of Great St. James itself is another popular spot we’re sure not to miss. After a day exploring the cove, we enjoy an evening under the stars with a fantastic dinner and cocktails. Today we hoist the sails and head for some of the incredible beaches of St John’s National Park. In the 1950s, the Rockefeller family donated more than 5,000 acres of land to the Federal government. St. John boasts, not just one or two perfect beaches, but beach after pristine beach. We take our pick, drop anchor, enjoy a delicious lunch and then spend the afternoon basking in the sun. That afternoon, we head for Leinster Bay, a beautiful secluded beach where we have dinner and enjoy the evening sky. This morning, we take advantage of the great snorkeling which makes Leinster Bay popular. If you interested in a little more strenuous of a work out, you can choose to explore the hiking trails which lead out of Leinster Bay 1.8 miles up to the Annaberg Sugar Mill ruins. Here you will step back in time and get a feel for the equipment and labor of the 18th century sugar mills. The Annaberg Sugar Mill has the distinction of being the largest, tallest windmill in the Virgin Islands. At the site of the ruins, you can see this along with the rest of the mills structures while taking in the amazing views of Leinster Bay below. After a delicious lunch back on board, we head to Jost Van Dyke. After clearing customs in Great Harbour, we enjoy some time at Foxy's and join up with other fellow sailors. Tonight’s activities are filled with live entertain at these local watering holes and then return to the yacht for a peaceful nights’ rest. After a delicious breakfast, a cup of fresh coffee and an early morning dip, we're on to White Bay. No visit to the islands is complete without a visit to one of the sailor’s hotspots of Ivan’s Stress-Free Bar and The Soggy Dollar! After lunch, we are off to Peter Island. Home to the beautiful Peter Island Resort you can take a walk through the grounds before a delicious meal back on the boat. Take a romantic evening stroll along the beach while you enjoy the amazing colors of the sun setting over the islands. Today we take a short sail up to Cooper and Salt Islands for some incredible snorkeling around the wreck of the Rhone. The Wreck of The Rhone is one of the most famous dive and snorkeling sites in the world. Located off Salt Island, the R.M.S Rhone (Royal Mail Steamer) went down in 1867 in a hurricane and here you’ll get a glimpse of one of the first iron sailing ships ever built as she rests from 20 to 80 feet on the ocean floor. That afternoon we head back to Hodges Creek on Tortola where we’ll get cleaned up and head out for dinner out at one of Road Town’s great restaurants or relax at the Marina's restaurant. After a night cap back on the boat and a toast to a fantastic week, it’s off to bed. After breakfast, we exchange email addresses and say our goodbyes until your next island adventure!